MVE^2, Expert of the Year 2017-2011, Scribe 2016-2012, Author of the Year 2017-6,2013-2012 VMware vExpert 2018-2011 27 years of experience. In vSphere 4 1 and 5.0, you can enable both Remote SSH and the ESXi Shell for management of hosts from the vSphere Client and from the Direct Console User Interface. You may have noticed that on enabling both Remote SSH and the ESXi Shell for management of hosts from the vSphere Client and from the Direct Console User Interface that a Configuration Issues warning yellow box appears on the Summary page of the host ESXi server. This Configuration Issues warning yellow box only appears when Remote SSH and/or ESXi shell has been enabled. 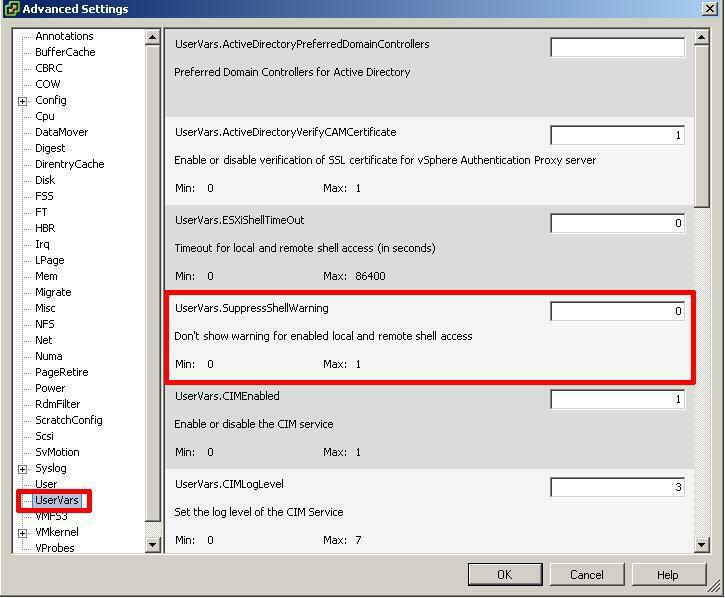 If you are also connected to a Windows vCenter Server using the vSphere Client, you will also notice there is also a yellow/orange warning triangle displayed on the host server. There is no vSphere ESXi configuration issue, VMware vSphere Hypervisor (ESXi) and VMware vSphere vCenter server are indicating there is a possible security issue with your installation, you may not be aware that SSH and ESXi shell have been enabled. The only issue, is that the Warning triangle displayed in VMware vSphere vCenter can mask real warning events. 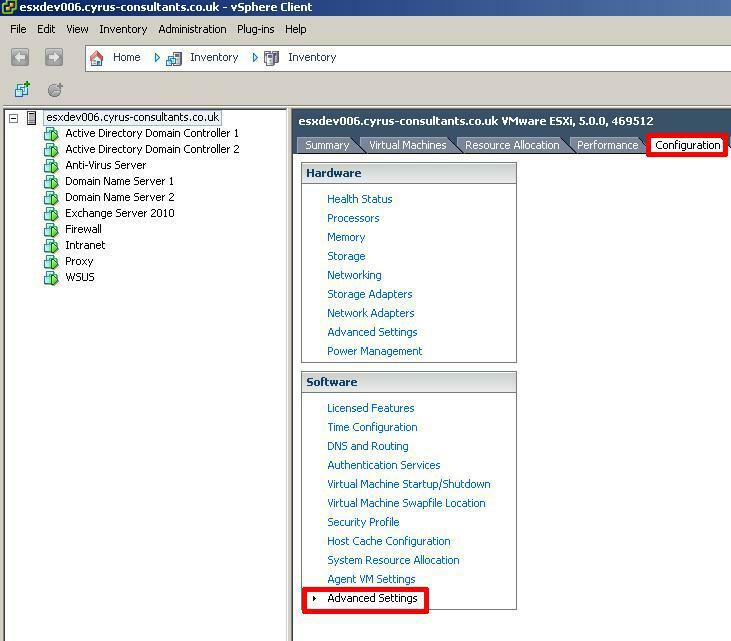 Using the VMware vSphere Client, Login and Connect to the ESXi server, using IP address or hostname of the ESXi server, using root username and password credentials. 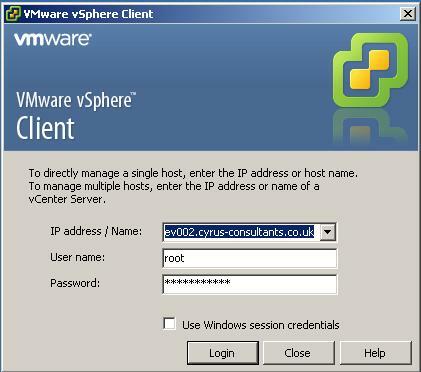 If you have a VMware vSphere vCenter server, you could also specify IP address or hostname of the vCenter server. 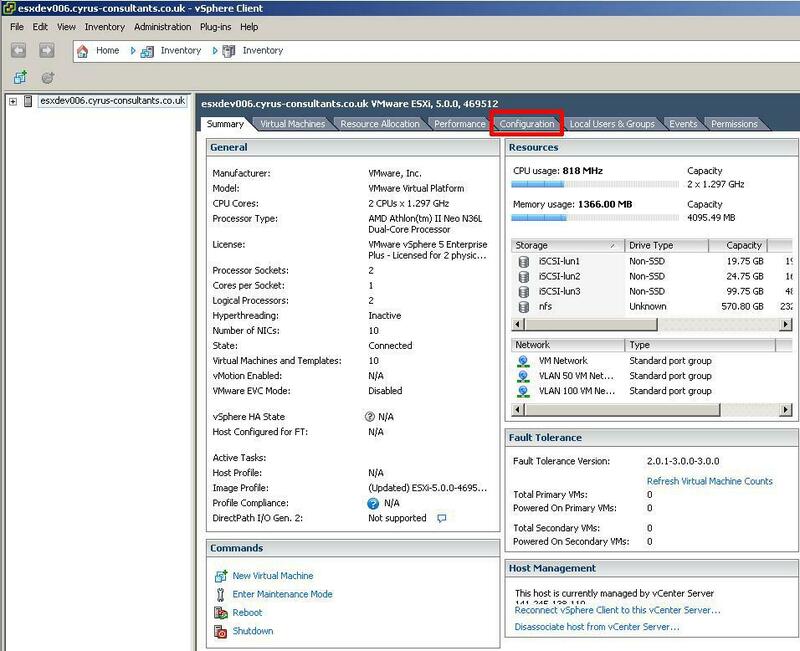 Once you are logged into and connected to the host ESXi or vCenter server, Select the host ESXi server, followed by the Configuration Tab. Click the Advanced Settings option at the bottom of the list. 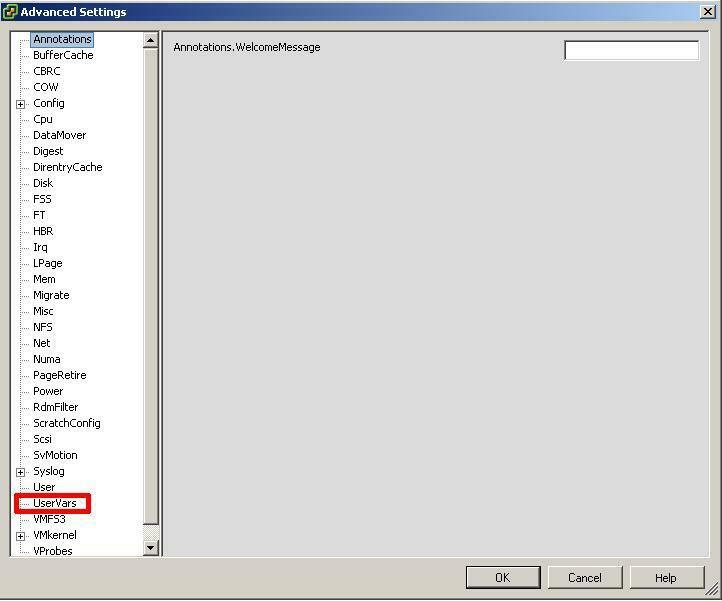 After Clicking Advanced Settings the following Advanced Settings dialogue box will open as shown in the following screenshot. Navigate to and Click the UserVars section. Set the value of UserVars.SuppressShellWarning from 0 to 1. The Configuration Issues yellow box in the Summary Page and Warning Triangle will disappear immediately. Please note: the variable UserVars.SuppressShellWarning is only available in ESXi 4.1 U2, ESXi 5.0 and vCenter Server 4.1 U2 and 5.0 only. Thank you for reading my article, please leave valuable feedback. Enjoy this complimentary article view. Get unlimited access to our entire library of technical procedures, guides, and tutorials written by certified industry professionals. Using this article for work? Experts Exchange can benefit your whole team. Experts Exchange is a tech solutions provider where users receive personalized tech help from vetted certified professionals. These industry professionals also write and publish relevant articles on our site. If you have a question about something within an article, you can receive help directly from the article author. Experts Exchange article authors are available to answer questions and further the discussion.